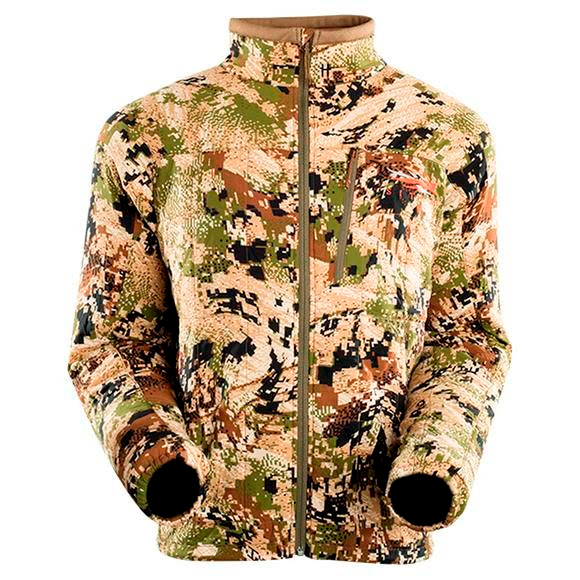 A necessity for any true backcountry outing, the Sitka Gear Kelvin Active Jacket features 80 gram Polartec® Alpha insulation for maximum versatility - an ideal outer layer in mild conditions and perfect insulation under a shell when the mercury plummets. Soft, quiet and breathable, this workhorse knows no off season. The Kelvin Active Jacket is single-minded in its intent: ultralight, packable and warm. This minimalist mid-layer wraps your upper body in 80 g/m2 Polartec® Alpha synthetic insulation, delivering highly efficient temperature maintenance even when wet. Your stalk may continue; there is no longer a need to shed layers to release excess heat. Polartec Alpha Active is a non-migrating lofted fleece insulation that offers superior breathability and moisture management allowing us to construct a garment with a more open face or liner fabric. By keeping moisture vapor moving freely through the fabric it increases overall air exchange and drastically speeds up dry times. This advancement increases thermal adaptability in changing conditions and different phases of physical activity. Zippered chest pocket secures your necessities and doubles as a stuff sack, while hand warmer pockets offer additional warmth. Designed to be worn under ultralight outer layers like the Dewpoint or Mountain Jackets, or as an outer layer in earlier seasons, the Kelvin Active Jacket is the cornerstone of your light and fast backpacking system.